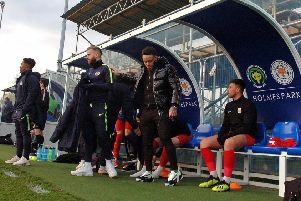 The Smiths, Jack and Ryan, saw off Holwell on Saturday with a brace apiece as new manager John Webster had a tough start to his league career at Welby Road. Tom Harris opened Holwell’s account on 10 minutes after Radcliffe’s keeper Dunn, flapped at a cross from the right. The visitors couldn’t clear the resulting corner and Dunn made two point-blank saves, but the second spilled to Harris who found the net. Everything looked to be going to plan as Holwell dominated the first 35 minutes and should have been out of sight, with chances falling to Graham Wells and new signing Andre Fontoura. Radcliffe took all of this time to try and string something together, but their back four were by far the busier with Dunn keeping his side in the match. The hosts had to keep their concentration at the back as Liam Smallwood caught Holwell keeper Witham off his line, and was relieved to see the ball strike the bar as it dropped over his head. However, on 37 minutes, Holwell failed to control a ball up the right wing. Ryan Perkins intercepted and played in Jack Smith who beat Witham from close range to level. As if Witham had not taken note, he was again off his line five minutes before half-time when Smith’s chip from the edge of the box put the visitors ahead. Holwell rallied and Harris had the ball in the net again, but the goal was disallowed as Ian Bitmead was judged to have impeded the keeper’s line of sight while offside. It was difficult to comprehend how, after such a strong start, the hosts were now behind at the break. Holwell just couldn’t get going in a scrappy second half with midfield distribution poor. A frustrated Fontoura was booked for niggly fouls and it seemed the home side were really missing Chris Hibbitt, Kieran Foster and Mark Tinsley, all unavailable due to holidays. The visitors looked the more dangerous as the half wore on with Ryan Smith replacing the injured Perkins in midfield. It didn’t take long for the substitute to get his name on the scoresheet with 18 minutes left as Liam Chapman sold his keeper short with a back pass. Smith reacted quicker and easily rounded Witham for 3-1. Holwell’s lack of concentration was evident again six minutes from time as Witham spilled Yeomans’ innocuous shot into the path of Ryan Smith who added gloss to a flattering scoreline for Radcliffe. Not the start to this year’s league campaign Holwell wanted, but there were signs of good movement and real speed in attack where Harris served up a strong showing of intelligent wing play, running at defenders when he could. Fontura also looks a good addition as his pace caused problems down the right flank, linking well with new full-back David Reeves. The home defence were strong with Ridout and Bitmead working well together in the centre, but a lack of concentration led to three goals against a team which looked there for the taking for the first half-hour.